This book provides a comprehensive reference guide to World War II aircraft, with full specifications for each aircraft including dimensions, power plant, weight, performance and armament. 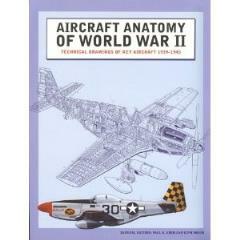 A must for every World War II history buff - perhaps especially veterans, their families and friends and the aircraft model enthusiasts who still love these old planes - this book provides full-color artworks of more than 50 key aircraft with up to 200 design elements clearly annotated on each cutaway drawing. Edited by Paul E. Eden and Sop Moeng, longtime writers in the aviation partwork field (Moeng has even produced a major 35-part aviation video series), this book really gives a sense of the major differences between modern fighting aircraft and the technology available to what has been termed "The Greatest Generation." Even those who aren't technically-minded will find the pictures interesting.